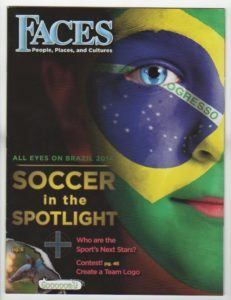 This incredible issue focuses on the Brazil 2014 FIFA World Cup. I have four articles in this issue. I am part of an avid soccer family. They gave me ideas for queries to submit to FACES magazine. FACES accepted all three, and asked that I do one more – Could I find academy players to interview? Of course! I never turn down a challenge. Click on each article page below to see the whole article. “When the Cup Comes to Town” takes a critical look at what really happens when a country agrees to host the FIFA World Cup. Is it just one big party? Who pays for the party? And what happens when everyone leaves after over a month of celebration and games? “Training the World’s Next Stars” takes you inside a youth football academy. Many World Cup teams have famous, highly skilled players that were brought up in football academies in Europe and South America. Players were spotted as young as 6 years old by scouts. How do you get into an academy? How much do the players train? What is the United States doing to compete on this powerful international player stage? “Growing Up: in a Football Academy” spotlights three players, Ryan Palmbaum, 14, of Club Atletico Boca Juniors, Buenos Aires, Argentina, Issac McGinnis, 14, U.S. Soccer Revolution Empire Development Academy, Rochester, New York, and Tommy Gallina, 14, also with U.S. Soccer Revolution Empire Development Academy. Their schedules are eye-openers. “Top Young Players to Watch” picks just five of the hottest young players. It was hard to choose and everyone has their favorites – so add these player cards to your collection. They are thrilling to watch, and have worked with brilliance for their position on the field.